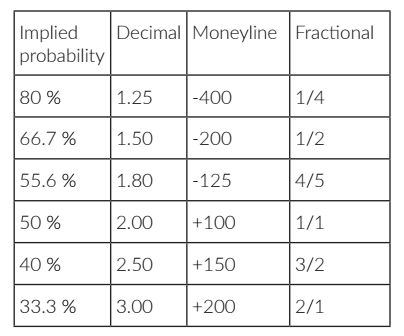 Widely used in various parts of the world, decimal odds is arguably the easiest odds format to comprehend. They reflect the inverse of the probability of its corresponding outcome. Decimal odds quote the ratio of the potential payout to the initial stake. In other words, if you place a $10 bet at odds of 1.9, a winning bet returns $19. Remember that the stake is included in the return, making the remaining $9 your profit. Also called American odds, Moneyline odds can either be quoted with a positive or negative sign. When positive, the number indicates the potential profits on a $100 bet. This is used when the outcome is considered less likely to happen than not, and suggests that you are betting on an underdog. When negative, the number indicates the amount that must be wagered to potentionally win $100 in profits. This is used when the outcome is more likely to happen than not, making a negative sign the hallmark of a favourite. Favoured in the United Kingdom and Ireland, fractional odds quote the potential return relative to the stake. For example, a won £100 bet at odds of 2/1 would imply that the bettor made £200 in profits, whereas the same bet at 1/2 imply profits of £50. HOW DO THESE THREE ODDS TYPES RELATE TO EACH OTHER? No. Bookmakers usually give you the option to choose your preferred odds format. If you understand the conversion table above, you are probably more profficient than you necessarily need to be.